Bringing a baby into the world – whether it is your first or your fifth – should be one of the happiest times of you and your partners’ lives. From hearing your baby’s first cry to seeing their first smile, for many parents – even through the lack of sleep and nappy changing – the first few months of their baby’s life will be cherished forever. Baby blues affect many of us, particularly first-time parents, and it is completely normal to need a few weeks to adjust when a new baby arrives. Doctors suggest baby blues normally last between two days and two weeks – however, if you feel your depressive thoughts are persistent or worsening after this time, you could be experiencing the symptoms of Post-natal Depression. Post-natal depression is the name given to the type of depression that occurs soon after your baby is born. It usually begins within weeks of the birth and can cause anything from mild depressive symptoms to completely disabling episodes that can require inpatient treatment. Everyone’s experience of post-natal depression is different with some women experiencing symptoms whilst they’re still pregnant and others several months after the birth, however with the right form of assistance in place it can be treated successfully. Post-natal depression affects more than one in ten women in the UK, and those who struggle with the condition have a 30% higher risk of the condition occurring with their next baby. The condition is widely understood throughout society thanks to frequent exposure in television and films, however what is rarely mentioned is that new fathers can experience the condition too. 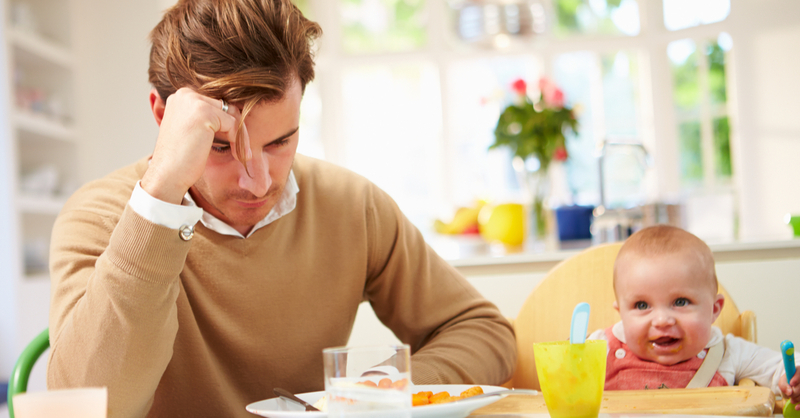 Men with post-natal depression is a lot more common than people might think. Like with women, symptoms usually begin within six months of the birth and symptoms often go untreated with many men not seeking assistance for the condition. New dads are 50% more likely to become depressed within a year of the baby being born than men who don’t have any children and around one in 10 new dads experience post-natal depression within the first year. Post-natal depression is a lot more common in the partners of women who have also suffered with post-natal depression. Lack of social life and avoiding spending time with friends – when a new baby is welcomed into the world it is normal to have a lot less time on your hands, and to prioritise homelife over a few beers down the pub with the lads. However, once you’re settled into your new routine and you find you have a little time to enjoy to yourself again, if you’re still avoiding spending time with your friends and getting back to your social life, you could be experiencing the symptoms of depression. Change in appetite – mental health and what we eat are often a lot closer related than most people realise. A change in your mental health can both increase and decrease your appetite and change your relationship with food. Those suffering with depression often find themselves eating a lot less, with one of the biggest symptoms of depression being lack of appetite, however depression can also cause an increased appetite as well as episodes of binge-eating. Increased anxiety – depression and anxiety often go hand-in-hand and many people who experience one, also experience the other. Experiencing increased anxiety after the birth of your child is completely normal, however if you feel your anxiety increasing as the months go on it could be a sign that you’re experiencing post-natal depression. Struggling at work – often when feeling depressed or struggling with mental health, staying on top of things at work can prove all too much. If you find yourself becoming increasingly stressed whilst at work or struggling to complete your tasks over a prolonged period of time it could be more than just sleepless nights that is taking its toll. Aches, pains and sleep problems – depression often causes physical pain including; back pain, muscle pain, headaches and migraines and a number of different mental health conditions cause sleep problems, with many depression sufferers struggling with insomnia. Managing insomnia and bodily aches and pains, alongside a new baby and a job can feel impossible, however a quick chat with your doctor or health visitor could go a long way. Lack of energy – for many new parents finding the time to be active and social after the arrival of a baby is impossible. In fact, for some first-time parents finding the energy to do the most basic things such as cleaning the house or cooking a meal doesn’t happen for the first few weeks – and with regular feeds and sleepless nights it is completely normal. However, if your energy levels continue to fall, or you find yourself struggling for more than the first few weeks or months, it could be a sign that you’re suffering from post-natal depression. If you have been experiencing a combination of the above symptoms for a number of months, it is possible you could be suffering with post-natal depression. There is often a negative stigma around men with depression, with previous generations encouraging men to keep their feelings inside. However, in the UK suicide is the biggest cause of death among men between the ages of 20 and 49 and men are three times more likely to attempt suicide than women – but a conversation can be the start of the road to recovery if you are struggling with your mental health. Speak to your partner and family, friends, your health visitor or your local GP if you think you or a loved one is suffering with the symptoms of post-natal depression. Both cognitive behavioural therapy and cognitive analytical therapy can be very successful in relieving the symptoms of post-natal depression in both women and men. Online therapy is a great way to fit in sessions around your new baby’s routine and hectic schedule, visit our site to learn more about how online therapy can help you.